Zoids is another one of those kids action animation shows, big robots, lots of action and very little plot. Or is it? The robots are there, and they're certainly big. There's a decent amount of action, but what's most surprising is the lengths gone to with plot development, or at least it's surprising for the intended market, kids. 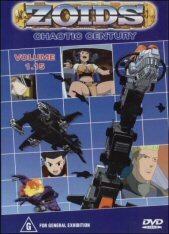 Having only seen this disc, and being number 15th in the first volume, I certainly did get the feeling that I missed a lot of the back story that had obviously gone on. The disc only contains 5 episodes, but for around $10 it's perfect for kids wanting to collect them. The problem with this disc is that whilst it appears the conflict that goes on throughout the disc has only just started, it doesn't end on this disc, meaning you will have to go get the next disc to see what happens. It's especially annoying that going by the previews of the next disc, the conflict finishes in the first episode of the next disc. Speaking of the conflict, it centre's around the Global Force fighting against an "Evil Madman" named Hillz, who is in possession of the Death Stinger, an almost indestructible zoid of immense power, with a charged particle weapon capable of enormous amounts of damage each shot (I'm guessing those who have followed the show will know exactly what I'm talking about). None of there Zoids are capable of defeating the Death Stinger alone, and possibly not even in a force. There only hope is the Ultrasaurus, an massive zoid, that eclipses everything else. The problem is that it has never been tested, and as such no-one knows if it will even work! The picture is presented in 4x3, which is perfect for the TV in the bedroom (or your children's TV?). The colours are a little bit subdued, which is surprising and unfortunate considering how good animation can look. It's all a bit too dull and lacking in contrast. I'm sure the problem lies with the source material, but it's still a problem as far as I'm concerned. Other than that, the picture is great, just as animation should be, sharp and detailed. It even has a nice high bit rate, which just worsens the above problems, it could have looked so much better. 2.0 channel audio is all you get, but like the picture it's suited well to the material. The voices are clear, and don't get overpowered by all the fighting and explosions. There's not really any extras, all you get is what is essentially a trailer for the next 5 episodes. It won't really do anything but make you either want to buy the next collection, or just annoy you, all depending on what your thoughts of the show are.